Philadelphia and the University of Pennsylvania have been at the forefront of the education of American architects since the late 19th century. 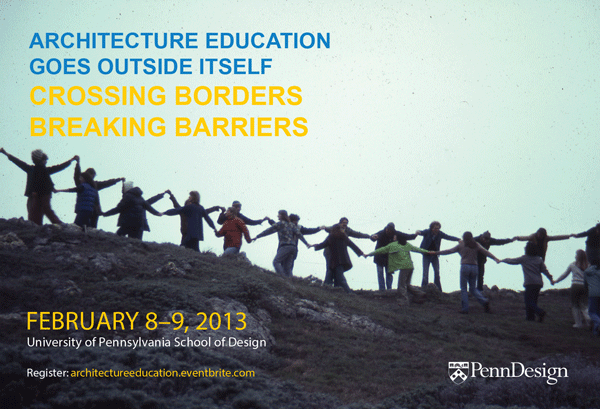 This past weekend, the University's School of Design held a two day conference, Architecture Education Goes Outside Itself, on the evolution of architecture education in the past century-and-a-half from the first "school"—a correspondence course created in nearby Scranton, PA. A group of young scholars selected, and perhaps inspired, by Penn professor Joan Ockman (whose important new book, Architecture Education: Three Centuries of Educating Architects in North America, thoroughly covers the subject) presented papers on America's always-evolving efforts to initiate and rethink the education of architects. From the debates on the value of aesthetics versus technical requirements and the AIA's desire to direct educational policy, to Lewis Mumford's attempt to open up architects to outside influences and Sigfried Giedion's plans to bring history to Harvard despite Walter Gropius' ambivalent relationship to teaching history, these scholars focused on dozens of important moments of change in architecture schools. In the post-World War II period there were papers on G. Holmes Perkins experiments at Penn, Feminist summer schools and the AA unit system and it's influence in America, travel as a form of knowledge in design studies starting with the Venturi's Yale trip to learn from Las Vegas and teaching at historically black colleges and universities. In all of these sessions the question of the future of design education seemed never to be far from the speakers' and audience's interest and concerns. Penn dean Marilyn Jordan Taylor and professor David Leatherbarrow provided the right amount of levity, insight and passion to keep the symposium focused and on point throughout the two days of talks and discussion. Finally the university's glorious architectural archives were put on view in a special exhibition in their Kroiz Gallery that focused on education topics. A entire series of water damaged boards from Venturi's studio visit to Levittown complimented Beaux Arts renderings and Robert le Ricolais models in the exhibition which is open to the public.